“Be thankful for everything for soon there will be nothing.” This dire warning is laid over the bio hazard symbol as a sign of the impending times on this Biohazard Hoodie. 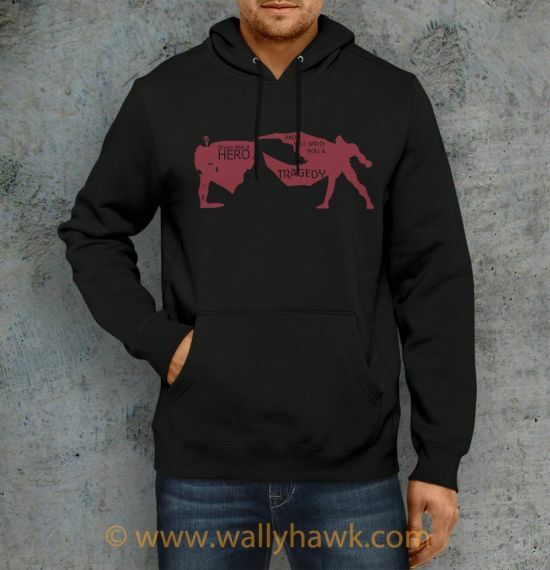 This high quality biohazard hoodie is for any fan of the zombie genre. Zombie’s are absolutely massive in pop culture right now. Infiltrating books, magazines, comics, movies, and even one of the largest scripted TV shows on television. The zombie craze has been around since George A Romero first gave birth to it in 1968’s Night of the Living Dead. The bio hazard symbol and this quote represents all of the zombie genre but gained a lot of popularity with 2002’s amazing 28 Days Later. Whether it’s the flesh and brain crazy rotting corpse zombies from The Walking Dead, the cute emo girl zombie from iZombie or something even goofier like Plants vs Zombies, we can all agree that zombies are cool. This biohazard Hoodie takes something of a darker approach, but it’s great for zombie fans of any build. The Biohazard hoodie is incredibly soft and comfortable. It’s a 50/50 cotton/poly blend. The design is done in pressed vinyl that never fades.